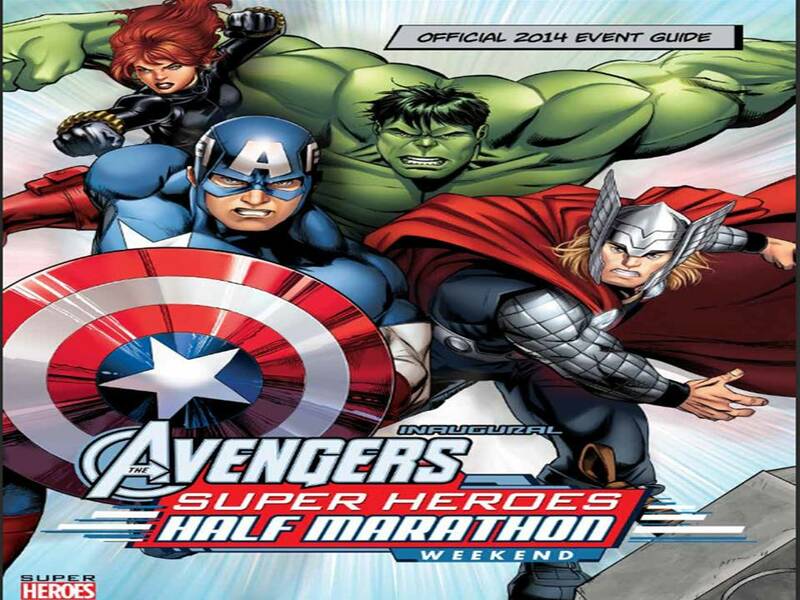 Avengers Super Heroes Half Marathon Weekend Program is Here! The first thing that popped out to me is the weekend itinerary. It’s always good to have the general layout of the weekend. It all begins on November 14th with the Expo. If you want official runDisney merchandise, you should plan on arriving early. I arrived at a little after 11am for the Disneyland Half Marathon Expo this year and there was already quite the line to get in. This is an inaugural race and it’s Avengers. So, if you’re already planning, you might want to try to arrive around 10am or 10:30am. Just sayin’. I added the box around Packet Pick-Up. Why? This is the first runDisney event at Disneyland where you will be required to pick up your own race packets. Gone are the days where you can send someone to get your race bib and race shirt for you. From now on, you have to be there yourself or it’s a no-go…and you have to pick it up the day before your race. So, don’t miss this part. 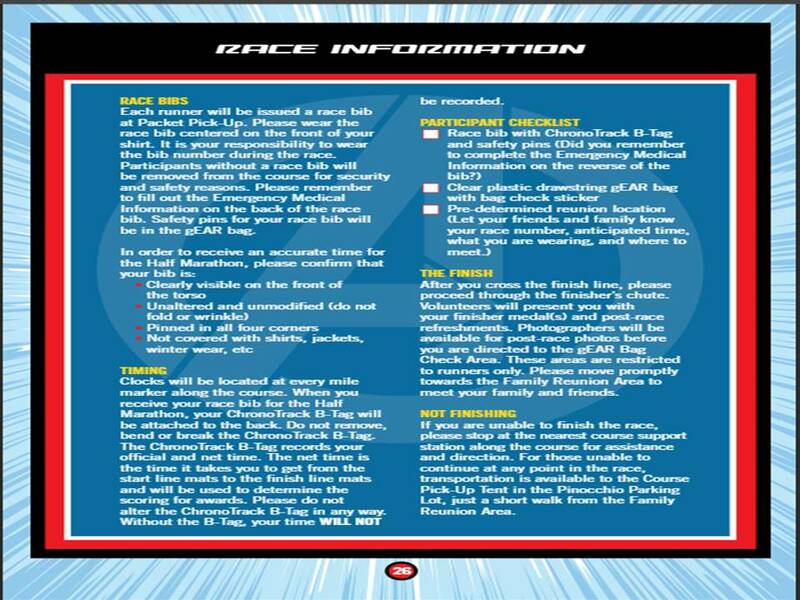 Next up, here is some of the general race information. With the continuation of the Race Information, you even get a handy participant check list for race day. I really want to highlight “the finish” section. “After you cross the finish line, please proceed through the finisher’s chute.” Everyone who is finishing wants that great finishing photo of themselves. If you stop close to the finish line, you could cause a safety issue or ruin another runner’s photo. So, don’t stop until you are clear of the finish line. Disney Cast members will encourage you to keep moving through if you forget. However, try to be respectful of other runners and not ruin their finish line photos by stopping suddenly. I posted a larger version of this. 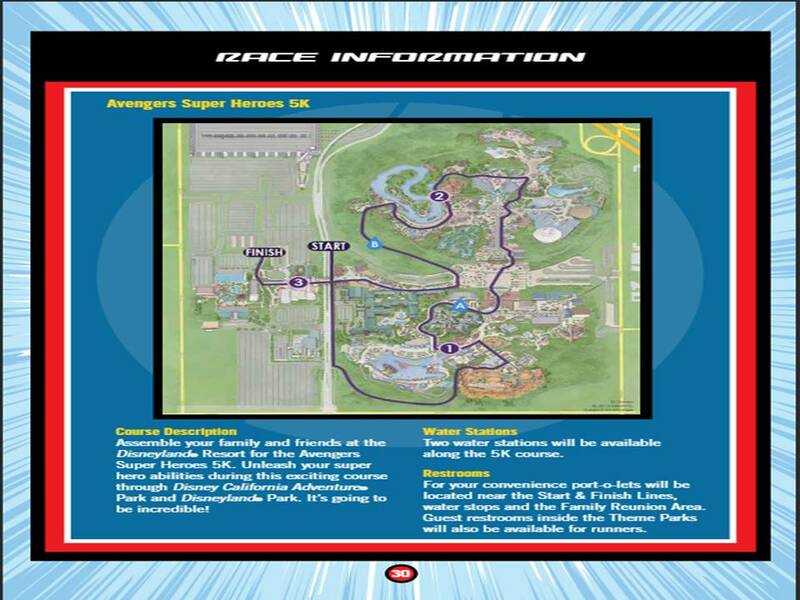 However, here is the Avengers Super Heroes Half Marathon course map! It’s always fun to read the official description of the course! I cut Thor off a little. 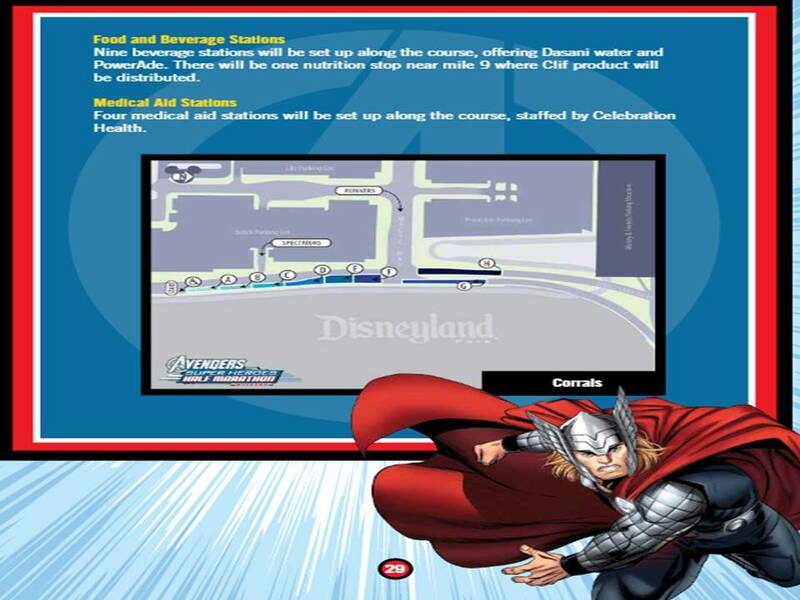 However, you’ll notice that there are going to be corrals A-H for the Avengers Super Heroes Half Marathon. I don’t know that means in regards to the number of runners in this race vs. the Disneyland Half Marathon (where there were a few more corrals). We also don’t have the waivers up yet. Nor are the corral assignments posted anywhere. I may be a little late in getting the information up. But, I will get them up when they come out. 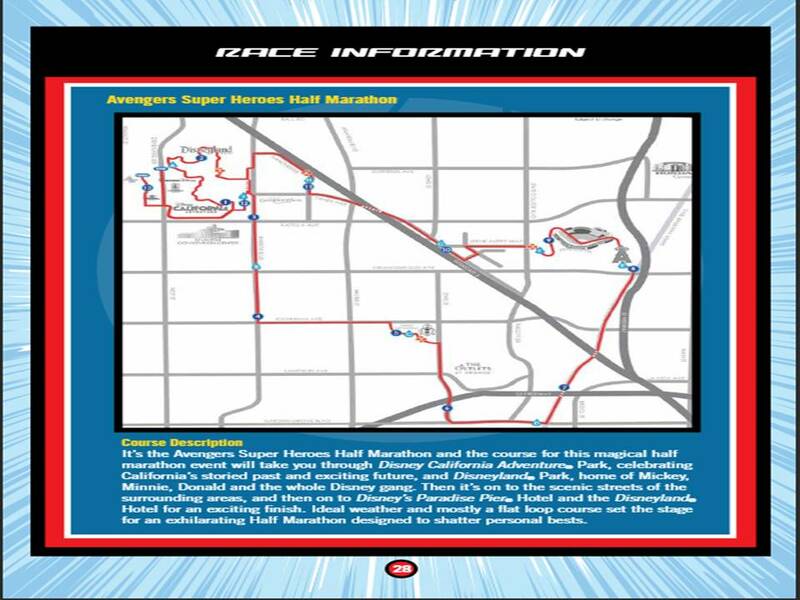 Even though, I’m not running the Avengers Super Heroes 5K, here is the course map for that race as well. 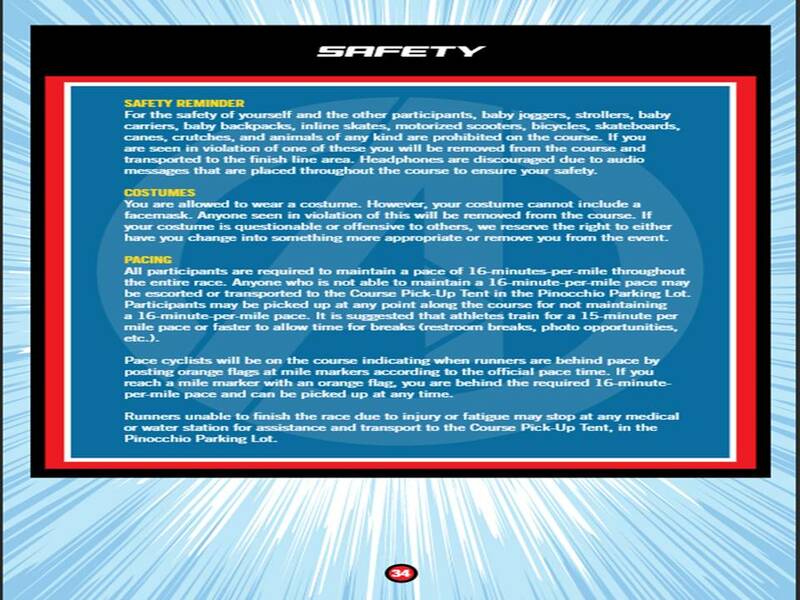 I’m only highlighting one of the two safety pages. You should read them. I think that this race is particularly one where the section about costumes should not be ignored. If you’re planning your costume, remember that this is a Disney race. So, some of the more racier Marvel outfits might get you banned from the race. Also, remember that you can’t wear a face mask. Again, with many of the Marvel characters, this might make it a more challenging task in your costuming. Be creative. Above all, make sure you will actually be able to stand running in the costume for the full race. Test it out ahead of time. 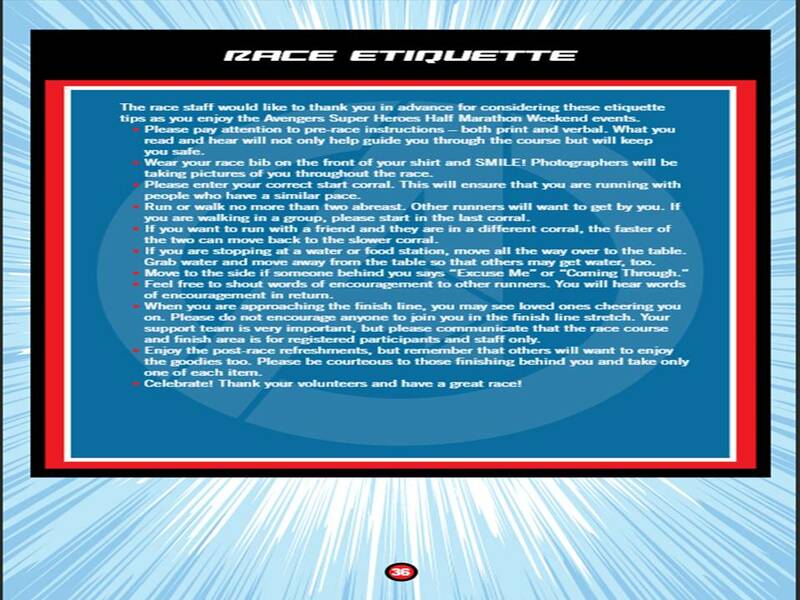 If your new to running, please, please, please read the Race Etiquette page. I was really impressed with how much they stressed race etiquette at the Disneyland Half Marathon. There may have been violations all over the course. However, runDisney did more to promote proper etiquette than any other race I’ve ever participated in. The race announcers threw in various points before the race. Don’t worry about other runners. Be the runner who follows proper race etiquette. Show others how it’s done! 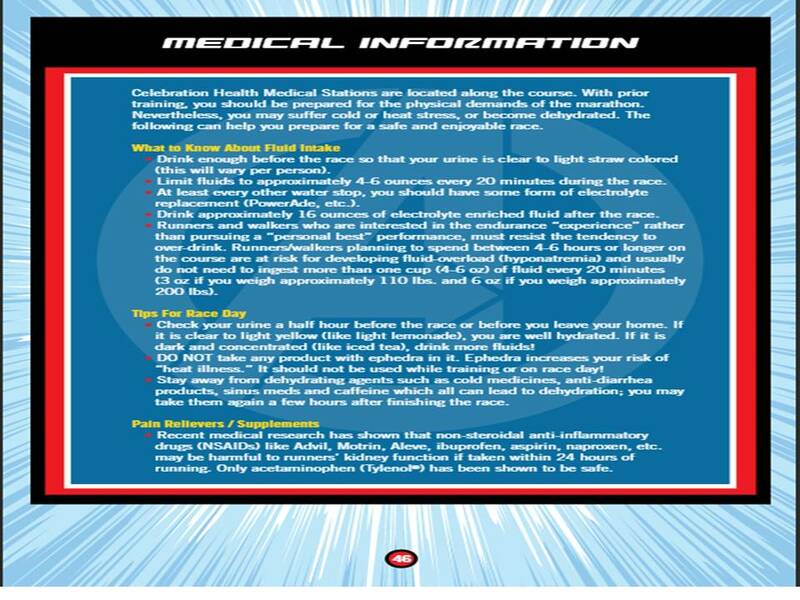 There are a few pages with medical information. I thought this page was very relevant. It talks about the fluid intake you should have for the days leading up to a race. Read this information NOW to you can plan accordingly. Our long runs are the best place to test out race strategy. After all, if you fail, you’ve got time to make corrections. 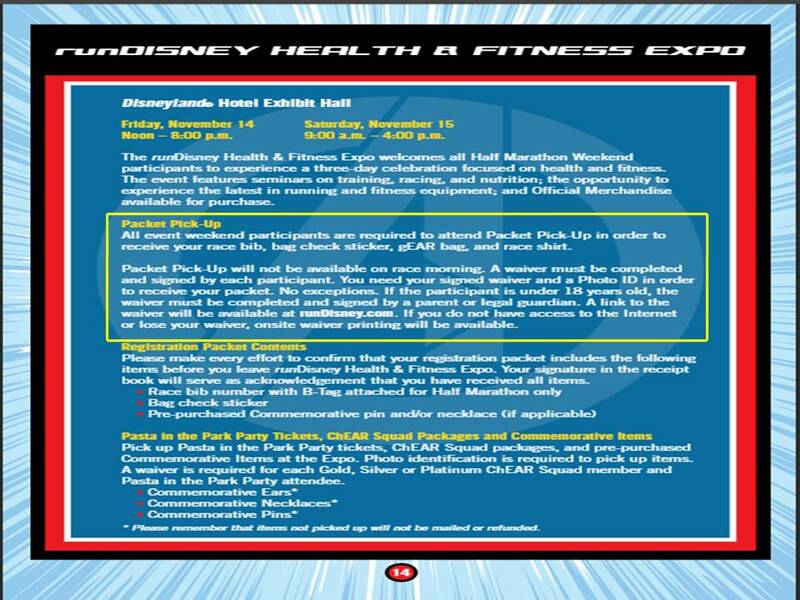 Since runDisney puts this information out there so far in advance, I recommend reading it. Even if you’re not running the race, you might take some time to browse through. Why? It’s a very well designed Race Program. 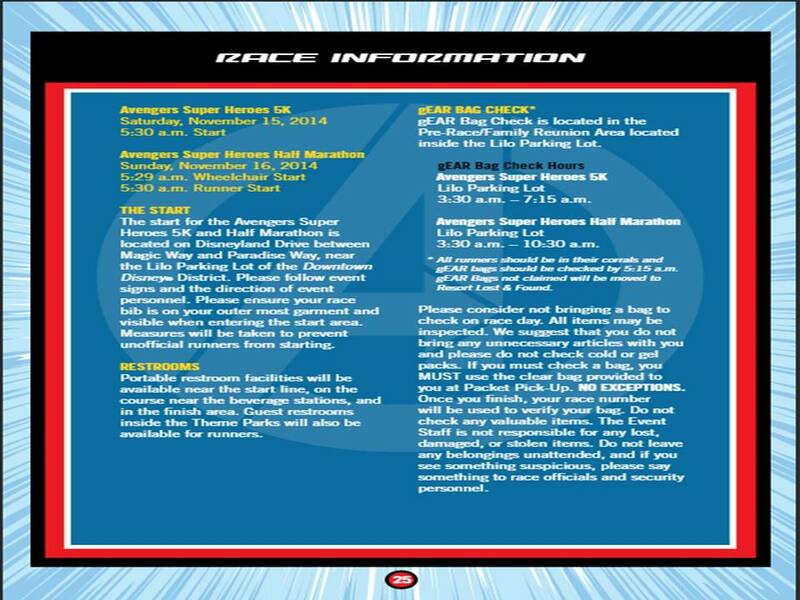 It’s so cool, that I can’t wait until we get to see the design of the Star Wars Half Marathon Weekend! Question of the day…which race etiquette point is one you wish EVERY single runner would follow, but usually ignores? One of the biggest issue in Disney races related to etiquette is to stop running more than 2 abreast. I hear ya on that. They did mention this before the Disneyland Half Marathon. However, I guess with 17,000 runners, there are those that aren’t paying attention. It’s really hard with the road narrows. 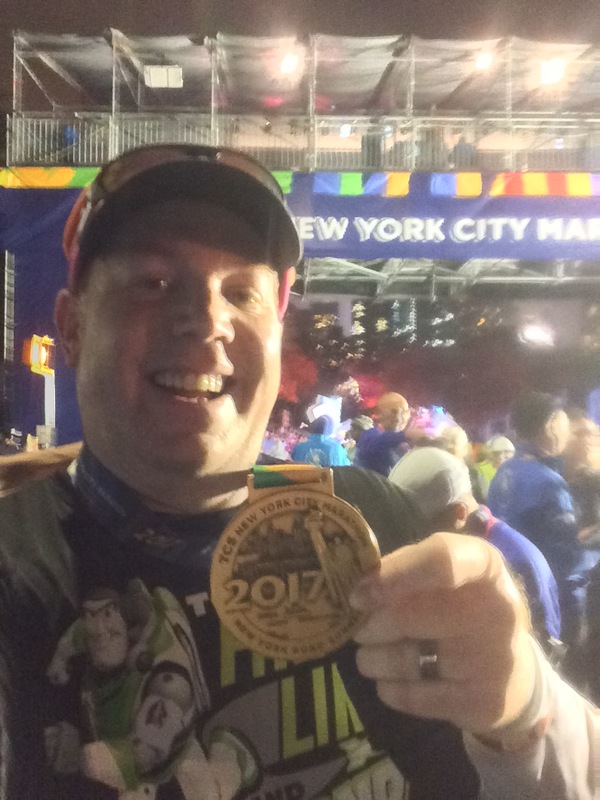 I totally agree about walking too many across.the DL half was much better than other races I have done but there was a new problem. Groups would be walking just 2 people but there would be a line of groups!! I think it is important to only walk 2 across but also pay attention to others in your area because you can quickly be 4-8 across! I noticed this as well. So, those in the two across think they are following the proper protocols. However, because they are next to other groups doing the same, it creates the same problem. When I get close to my walk breaks, I try to make sure I’m not clogging up a lane for someone who might think they are about to get through. 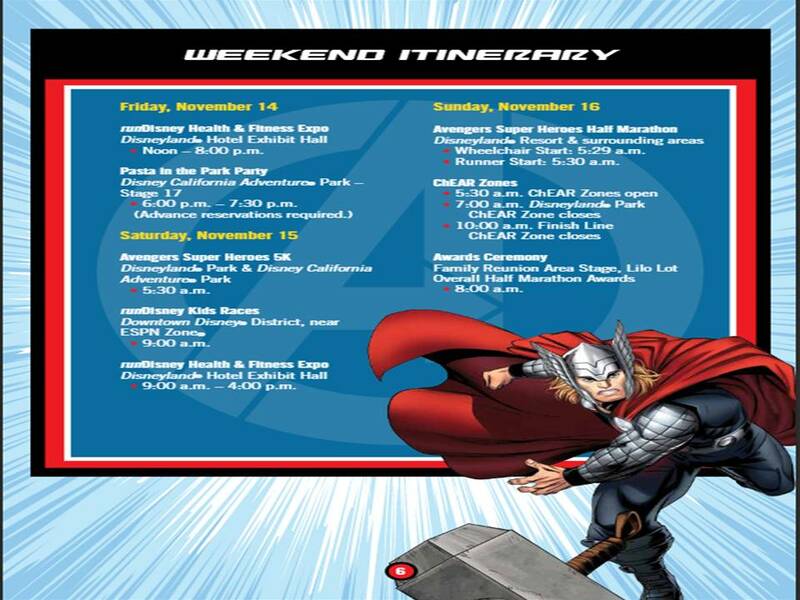 For those of you running the Avengers Half Marathon at Disneyland in November, here is some important information regarding the race. That’s interesting. I haven’t seen this happen yet. However, I totally agree. If you’re going to get a selfie (in any situation), try to make sure you’re not blocking other runners.